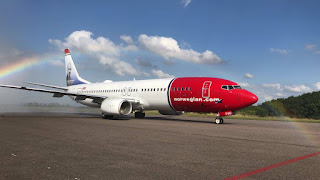 The World's best low-cost long-haul airline, Norwegian is continuing its exploration into the markets of South America. From the 4th September, the airline starts selling tickets for its first two domestic flights in Argentina. The new routes start on 16th October and will link Buenos Aires with Córdoba and Mendoza. Además️. In addition, the flight Buenos Aires - London route will go increase frequency from four flights a week to a daily service from the 1st December. Norwegian has plans to operate more than 150 domestic flights in Argentina as well as flights to from its home base of Buenos Aires to Peru. The airline has a Boeing 737-800 aircraft, with another nine on order. Argentina is not the only South American country that Norwegian plans to operate in, in a further step in its global expansion explorations. It has been announced this week that the carrier is interested in starting up domestic operations in Brazil. Brazillian tourism minister Vinicius Lummertz confirmed Norwegian can start operating international flights following approval earlier this month from Brazilian flights regulator Anac. The airline is expected to launch a flight to Sao Paolo from London Gatwick in March next year. Foreign airlines cannot at present be incorporated in Brazil, however, Congress is reviewing a proposal to change the law. If the law is changed, Lummertz advised Norwegian could slash domestic fares by half. Norwegian has yet to comment on its Brazillian domestic intentions.